Imagine if this were true. I've always been a fan of the WWE, especially its commentary. The reactions, signature phrases like JBL's "smokin' hot" or Jim Ross' "my god" have always riveted me while I was watching the action. As much as I love hearing Marv Albert and Steve Kerr color commentate, I would love to see Jim Ross and Jerry "The King" Lawler give it a go in any sports game. As you can hear, Jim Ross goes ballistic with his "my god, my god almighty" when LeBron James put rookie, Ben McLemore, on a poster. Now this is the most recent one; because of my curiosity, I found a few more of these. I'm amazed at what you can find on the internet. I loved this one especially because the dunk was even more epic and JR's "my god" was just so emphatic. DeAndre Jordan annihilating Brandon Knight never gets old. Not just basketball but Jim Ross and Jerry Lawler are experts at "good ole American" football as well. The funny thing is, Jim Ross and Jerry Lawler actually called Tavon Austin's 3 Touchdown game against the Colts. I initially thought different when Jim Ross was exclaiming, "Austin! Austin! Austin! ", thinking he was talking about Stone Cold, who's real name is Steve Austin. However, I realized that they actually called this when they said the word "seam". Anyways, this just attests to how good they can be calling something else than WWE. My favorite NFL one is Ross and Lawler calling Ahmad Brooks destroying Drew Brees; it's a classic. The sound the steel chair folding when Ahmad Brooks crushed Drew Brees, reforming Drew Brees' neck, seemed suitable. Now, the one I'm about to show you is by far the most clever one I've ever seen. Jose Bautsita, Blue Jays slugger, hits a Batista Bomb (known as a Bautista Bomb for name's sakes), the former WWE heavyweight's Finisher. 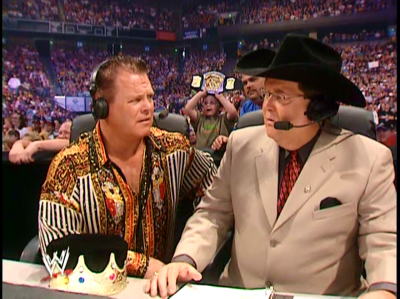 Jim Ross would certainly be better than Chris Berman yelling "back, back, back!" like a chicken plucking. If anything, I'd love to hear Jim Ross call NHL games, especially fights and hits. Hearing him call, let's say Zdeno Chara and Steve Ott, a "slobberknocker" or going wild with his "my god" comments after a hit would be more than enjoyable; let's just see. Now I don't think Jim Ross and Jerry Lawler switch to any other sport because, well they're WWE legends and are great at their craft, but I could see them venture into other sports for kicks. I see this happening one day. One of the reasons why I love WWE is because of the color commentary that is as interesting as the action; take that out and WWE loses some of it's entertainment value. WWE commentary is by far the best it is in any sport (I know WWE is acting but technically, it's still wrestling) and any other sport would be lucky to have the likes of Jim Ross and Jerry "The King" Lawler.